We evaluate the U.S. Supreme Court’s controversial decision in the Hobby Lobby case from the perspective of state corporate law. We argue that the Court is correct in holding that corporate law does not mandate that business corporations limit themselves to pursuit of profit. Rather, state law allows incorporation for any lawful purpose. We elaborate on this important point and also explain what it means for a corporation to “exercise religion.” In addition, we address the larger implications of the Court’s analysis for an accurate understanding both of state law’s essentially agnostic stance on the question of corporate purpose and also of the broad scope of managerial discretion. Lyman P.Q. 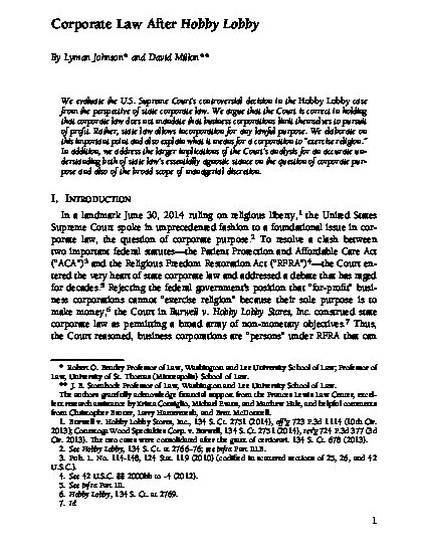 Johnson and David K. Millon, Corporate Law After Hobby Lobby, 70 Bus. Law. 1 (2015).